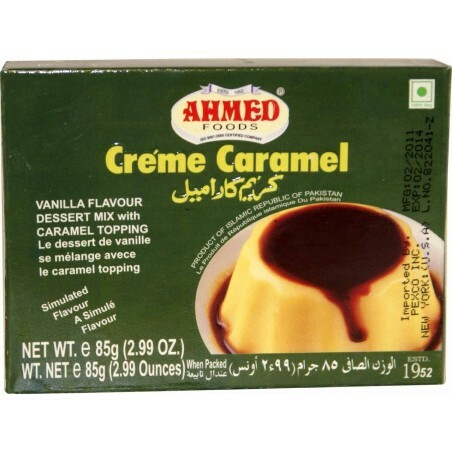 Ahmed Crème Caramel (85g). Vanilla flavour dessert mix with a rich caramel topping. Ingredients: Caramel mix, Refined sugar, Vegetable Gum (E407, E410), Modified Edible Starch, Artificial Flavours, Permitted Food Colours, Tartrazine (E102), FD&C No. Yellow 5, Sunset Yellow (E110). Allergen Advice: See highlighted ingredients. Colours may have an adverse effect on acitivity in children.